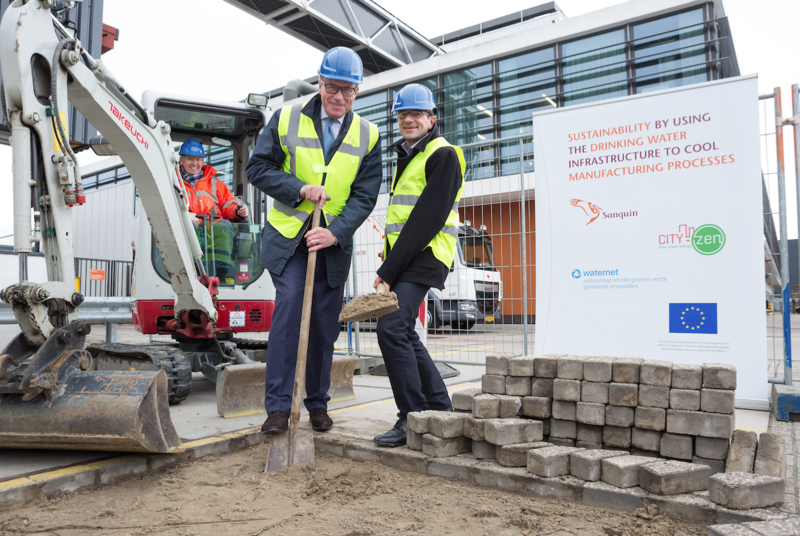 Beginning of November an innovative City-zen project in Amsterdam Nieuw-West was officially kicked off : blood bank Sanquin and water company Waternet started constructing a connection to the main piping system of the drinking water infrastructure. This connection facilitates the use of cold from the drinking water infrastructure. A project that creates a win-win situation for both parties, saving costs and the environment. During cold periods in winter the temperature of drinking water drops lower than desired. This creates an abundance of cold energy which can be extracted and either used directly in pharmaceutical processes or stored in an underground storage facility (a so-called aquifer thermal energy storage: ATES). The annual energy yield for the first years is expected to be 20.000 gigajoule, which equals the annual power consumption of about 1.800 households. In the future this will grow towards 40.000 gigajoule a year. Sanquin will initially only use the extracted cold for its pharmaceutical processes but is looking into expanding the smart cooling system to more of its operations and buildings. The system will become operational in November 2017.